INSTALLATION. 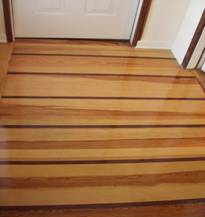 Installation and repair is the mainstay of Ascue's Artistic Wood Floors. From single room water damage repairing to full church or basketball court flooring installation, design and finishing, no job is too big or too small for us. We install raw tongue and groove flooring, then sand and smooth before sealing. Then we finish according to customer preferences for shiny gloss finishes to soft satin finishes. We assist in selecting the stain colors and finish that works best for the area, whether for high traffic entry areas or for baths, kitchens or with area rug decor. You’ll know you’ve selected a professional, experienced wood floor business when you choose Ascue's Artistic Wood Floors for your floors.